Thisis a transcript of the conveyance for two small pieces of land added to Eversholt churchyard in 1864. 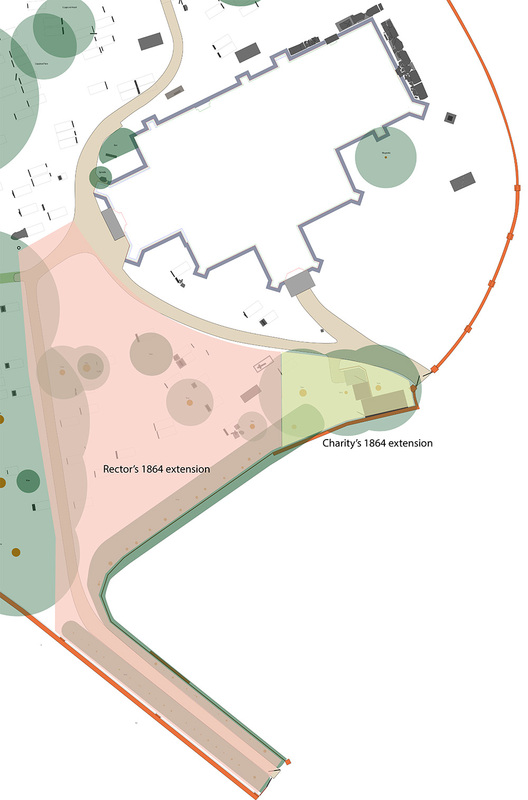 The small piece owned by the Eversholt Charity is where the current loo and garden shed sits. It’s plot 551 in the 1808 Enclosure book, “Tenement and Garden near the Church”, 3 square poles or about 75m2, where it is listed among the property of the Town Estate. The larger piece used to be the vicarage. It’s plot 552 in the 1808 enclosure book, 20 square perches or 500m2, listed there as “Old Vicarage House &c”, owned by the Rector. The associated sketch map is of very poor quality. It shows two plots, one approximating to the vicarage of 20 square poles, and a second plot of 3 square poles for the path down to the school. However, it’s not at all clear how they join up. The path is shown as a separate public path in the enclosure map. The mismatched quotes and brackets below are in the original. It mixes (square) perches and poles. A square perch is the same as a square pole, about 25m2. Blame Emrys Williams for all mistakes. He added the hyperlinks. John Addington Symonds has a fascinating wikipedia entry. I do hope I have the right one – his father had the same name, but the father was an MD, while ours is an MA. Here is a VERY APPROXIMATE map of the lands transferred.